Home / Videos / Mortgage Rates / Why did my neighbor get a better mortgage rate? There are numerous reasons some people get a better mortgage rate, including their credit score. Other factors that can impact the mortgage rate you’ll receive include the loan-to-value (LTV), type of property you are purchasing, use of property, type of loan, term of the loan, timing of the quote, and the fees associated with the rate. 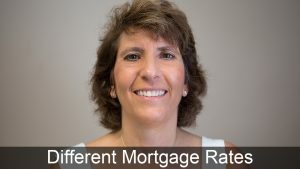 In this video, Mary explains these differences, so you understand the determining factors in the mortgage rate you’ll get on a mortgage, and hopefully help you get a better interest rate on your next mortgage. That question’s a little bit difficult to answer without knowing all of the specifics of you and what you’re purchasing, versus what your neighbor’s situation was and what they might have purchased. There are many factors that go into determining what your interest rate is. For instance, credit score is a very big determining factor. Somebody with a higher credit score is going to get a better interest rate than somebody with a lower credit score. Those differences vary significantly, too, whether you’re doing a conventional loan or an FHA loan. An FHA loan isn’t as credit score sensitive as a conventional loan is. It’s also going to depend on your loan-to-value. What is the loan-to-value? This is the relation between your loan amount and the purchase price, or the appraised value of the property you’re purchasing or refinancing. The lower your loan-to-value is, in other words, the more money you’re putting down, the better your interest rate’s going to be. It also varies on the type of property you’re buying. A condominium is generally going to have to a higher interest rate than a single family residence. Also, a duplex, or other unique type property, is definitely going to have a higher rate. Then, we’re going to look at the use of the property. Are you buying it to live in it? Is it an investment property, or a second home? The interest rate can vary based on those factors as well. Also, the type of loan. FHA loans generally are going to have a lower interest rate than a conventional loan. However, that doesn’t necessarily mean it’s a better loan for you. It also carries mortgage insurance requirements that maybe would be lower on a conventional loan, or maybe you wouldn’t have them at all on a conventional loan. So, you really need to look at the combination of the rate and other payment factors involving that loan. Lower rate is not always as good as it sounds. Also, the term of the loan. Are you getting a 30-year loan? 15-year? Or, is it an adjustable rate mortgage? All of those are factors that are going to have an influence on the interest rate that’s quoted to you. Another really significant factor is the time of the quote you received. I’ll get people that came to me with quotes that they got last week. Well, interest rates vary by the day, sometimes even change throughout the day. That quote you got is really only as good as the day you got it on. So, you want to make sure when you’re comparing rates between lenders, that you’re comparing the same programs, the same rates, at the same time. Also, there are fees associated with rates. You may have a lower rate because you’re paying a higher fee to get it. If you don’t understand the relationship between the rate and the fees, you could not be making an informed decision on which is the better deal for you. So, it’s best to work with a mortgage lender that will explain to you all the factors and give you the various options you have. There isn’t just one rate available to you. It can depend on whether you want to pay more, or whether you want to pay less. If you’re comfortable paying more and it makes sense financially to lower your payment and pay extra, that might be the better solution for you. But if you’re limited on cash, then maybe you want to go with a higher rate and save on fees. If you’re looking to purchase or refinance a property, we’d be happy to help you with a rate quote at no cost or obligation to you. Feel free to call us at Marimark Mortgage, 866-910-8020, or visit our website at www.MarimarkMortgage.com. Marimark Mortgage is a mortgage broker serving all of Florida, Virginia, and Pennsylvania. Not only did you find me a better rate than the “other guys”; but you also did it with less closing costs, no pressure, more patience, more professionalism, more courtesy, and much more accessibility.